Chinese Premier Li Keqiang (R) is flanked by Vice Premiers Hu Chunhua (L) and Han Zheng during a press conference in Beijing, March 20, 2018. The premiere appealed to Washington to 'act rationally' and avoid disrupting trade. While China and the United States seem to be negotiating in an effort to avert a trade war, Washington is unlikely to relent in its determination to stop advanced technology from leaving America for China. "I think there is a growing consensus in the United States that Chinese firms should be blocked from certain types of acquisitions of U.S. firms, of getting certain types of U.S. technology," said AlexCapri, an international trade scholar at the National University of Singapore. China has come up with a list of U.S. products it will target as part of a retaliatory action against Washington's plan to raise tariffs on Chinese products. But it has been silent about restricting technology companies. The European Union already is considering a law that would scrutinize and block Chinese purchases of local firms for the purpose of acquiring new technology. China is worried any U.S. action would embolden European politicians and hasten the process of prohibiting Chinese acquisitions. "I don't know that is unique just in the United States. I think there are other European countries, Australia ... so, I expect to see a lot more interference, a lot more blockage of acquisitions by either Chinese-owned funds or Chinese-owned tech firms that are looking to grow through acquisitions," said Capri. FILE - A logo of Huawei is seen during the Mobile World Congress in Barcelona, Spain. 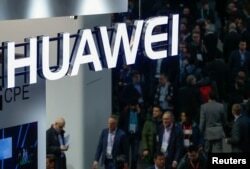 That has been evident in recent months as the U.S. put limits on China's Huawei technology company and clamped down on Singapore-based Broadcom because it is connected with Chinese companies and can work as a conduit to supply technology information. "Even in situations where you have tech firms that may not be flying a Chinese flag, if these companies are in fact doing business with other companies, then those acquisitions may be blocked," Capri said. It is this concern that led to Chinese Premier Li Keqiang's announcement last week that foreign companies no longer are obliged to share their technology with local partners when they invest in China. Obligatory knowledge-sharing by foreign companies has been the bulwark of China's technological development in past decades, and also a sore point with western companies and governments. "China needs some foreign inputs, and to attract ... high-end foreign companies," said Xu Bin, CEIBS (China Europe International Business School) professor of finance. The country also "needs to open more in the areas where China has not been open that much," he added. Li's offer also is colored by the Chinese parliament's recent decision to remove presidential term limits, which could give President Xi Jinping perpetual rule, Xu said. For Beijing, the situation is particularly bad because it has fewer opportunities to retaliate against the U.S. tech companies like Facebook and Google (Alphabet). Twitter already faces closed doors in China. Speaking on CNBC, Daniel Ives, head of technology at GBH Insights, said the company strongly believes that "Facebook, Amazon, Netflix and Google are 'primarily insulated' from tariff worries and a potential retaliatory trade war with China. Ultimately, the bark is much worse than the bite." Beijing also will find it extremely difficult to restrict foreign manufacturing companies and their partners in China, like Apple, which is using a Taiwanese company, Foxconn, to assemble products in Chinese cities. Such a move would hurt local firms and the domestic economy. 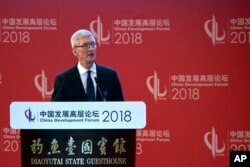 Tim Cook, Apple CEO delivers his speech at the opening ceremony of the China Development Forum held at the Diaoyutai State Guesthouse in Beijing, March 25, 2018. "For [Apple CEO Tim] Cook and company, given the tightly-woven integration between Apple and Foxconn in China, we believe there is minimal risk to this relationship," said Ives. "... And the last thing China is going to do is tinker with the Apple machine and impact its significant billions [of dollars] of investments in the country and major consumer sales within China, despite fears." There is another dimension to Li's seemingly generous offer. Many Chinese companies now want to protect their own intellectual property rights (IPR) as they venture into the U.S. and other countries. These firms have moved up the innovation value chain after starting with borrowed knowledge and are now capable of producing their own set of technologies. "China positions itself at the forefront of world innovation. So China needs also to protect their own IPR," said Lourdes Casonova, director at Cornell's Emerging Markets Institute. "The initial fear that China had when they opened their economy long ago is not there as it was. So they need to protect their own IP." At the same time, Beijing is hoping for support from an unlikely quarter — American multinationals that derive a substantial part of their revenues by doing business with China. That was evident last week during a conference attended by American CEOs in Beijing. "Countries that embrace openness, trade, diversity are the countries that do exceptionally well; and countries that don't, don't," Apple CEO Tim Cook said, adding, "The pie gets larger [when we are] working together. It's not just a matter of carving it up between sides." Investment company Black Rock CEO Laurence Fink gave it a fine point. "The world needs a strong China and a strong U.S.," he said. "The world does not need a public fight in which we reduce mutual opportunities."